Although you might not give it much thought, your parking lot is actually an important part of your business. In addition to giving customers and clients a designated, safe place to leave their vehicles, it also affects the overall look of the property and impacts whether your workplace makes a good impression. That’s why it’s important to maintain it and get it fixed when there are issues, say the paving contractors at Musson Brothers in Rhinelander, WI. Below, they list three signs you need to schedule repair services. 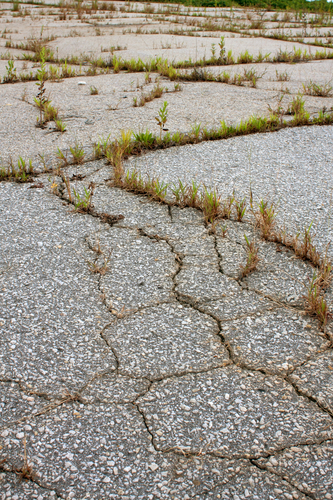 These large, missing pieces of asphalt are more than just unsightly. They actually pose a danger to employees and customers. Especially large ones can break the axle of a vehicle if someone drives over them, and if an individual trips over the edges of one, they might get hurt. Potholes also leave you open to liability: If damage occurs to people or property, you may end up involved in a lawsuit. Even small cracks will only get bigger over time. These are a natural effect of wear and tear, but they leave the parking lot exposed to moisture damage. During the freeze thaw cycle that is natural during the upcoming winter, cracks will expand. Once they get too big, you won’t just need a repair—you’ll have to replace the entire parking lot. Have you noticed certain parts of the parking lot, such as in the spaces, appear to be bowed or misshapen? Over time, heavy vehicles will actually wear down the surface and cause warping. Left unchecked, this can lead to larger issues, so it’s crucial to have this fixed right away. By taking the time to perform these simple repairs, you’ll save money and ensure your parking lot makes a good impression on your customers. The paving contractors at Musson Brothers have been in business for 73 years and offer a variety of services, including excavation. They even remove snow, develop sites, and fix driveways. To learn more, call (715) 365-8700 or visit them online.